my daughter has started to bleed and we are on our way up to the hospital, her recent scan showed baby had died in the womb. mum is worried the hospital will take her baby so we cant hold a cremation service for her. can I plan a cremation service without the hospital taking our granddaughter after she’s born? yes to both questions premature babies born at 20 weeks can have a funeral or cremation service although by law its at 24 weeks that the law states babies have to have a funeral or cremation which ever the family prefer. now you can use the hospital to do a communal cremation service with other babies which are done all at once, you can contact your local funeral directors to arrange a private one with them or contact the crematorium and arrange it direct with them too. after a miscarriage at 20 weeks crematorium will need paper work to prove the baby hasn’t been killed deliberately. the midwife at the hospital can sort this out with you. baby may need an autopsy first to determine the cause of death and then baby can be discharged to go to the crem funeral directors or home with mum until the actual funeral /cremation service. babies that go home will need to be kept cool due to the natural behaviour of death and the body’s reaction with decomposition. premature babies can have a cremation service even if he or she was born at 20 weeks gestation at home too.keep baby cool contact the midwife and let her know and she will tell you what happens next. a building known as a crematorium is like a church building in side flowers pews for family members and family to sit and a box like alter table at the front where the baby’s coffin will sit. you do not have to be religious or even have a religious service in crematoriums its a neutral type place to say a few words play a kiddies music cd or read out a poem. they will ask you if you want to leave the coffin out or disappear /lowered into the box where it will later be cremated called the interment. 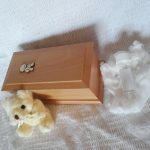 ashes are usually ready to collect a few days later in a plastic tub nothing fancy so here you can arrange to bring your own baby cremation ashes casket urn or wooden box. at a cremation service its all about timing you fit in a time slot depending how busy they are once you leave the building there is no reason you cant stay there pre order a dove release or butterfly release outside .we found this very peaceful after my own mums cremation service and everyone stood around whilst a poem was read out too, you can even keep a copy of the poem to take home with you a kind gesture that you can keep in baby’s memory box forever with you . no need to worry about were the doves go either they are homing doves like pigeons and fly straight home after they are released into the sky so beautiful.